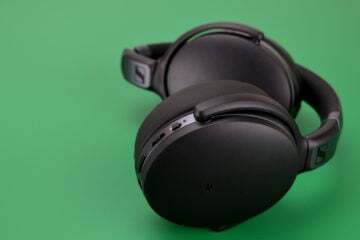 True wireless headphones are getting increasingly common, but despite being at the forefront of listening technology, some of them still have aspects that are a little dated. For example, many charge through a MicroUSB port — despite the fact that the newer USB-C standard is available. Some manufacturers, however, are adopting new technology with open arms. Like, for example, Rowkin, with the Rowkin Ascent Charge+ true wireless headphones. But what makes the headphones so technologically advanced? Well, they charge through USB-C, to be sure, but they also charge wirelessly with the included Qi charging pad. That, however, doesn’t necessarily make them worth buying. Are the Rowkin Ascent Charge+ worth buying? Do they sound good? We put them to the test to find out. As with anything, the first thing you’ll notice about the Rowkin Ascent Charge+ headphones is their design. The headphones, charging case, and charging pad are all a basic black, with white accents and while they could be described as a little boring, they’re also subtle — which some prefer. The headphones themselves feature a circular black design, with small silver bulb on the top. On the end of each earbud, you’ll find the Rowkin accent — which also features on the charging pad and the charging case. Speaking of the charging case, it’s a little bigger than other true wireless earbud cases. Like others, the bigger charging case serves a dual purpose — you can use the case to charge your phone, as well as charge the earbuds. Unlike other true wireless charging cases, instead of featuring a second port, you’ll just use the USB-C port. We really appreciate the fact that the USB-C port is used here — it’s well and truly time to phase out MicroUSB. Unfortunately, we found that using the charging case was a little frustrating. Some true wireless headphones snap easily into their charging case — but for these we had to carefully place them in the case to charge properly. We also didn’t like that there’s no way to control the earbuds from the headphones themselves — something that we find lacking. In the box, apart from the headphones themselves, you’ll find the charging case, Qi wireless charging pad, a USB-C charging cable, a USB-A to USB-C adapter, and two extra pairs of ear tips. It’s a nice selection of accessories, and we appreciate that. In general, the design of the headphones was a little boring. While we appreciate the tech used and the range of accessories, the fact is that the actual earbuds don’t look all that interesting. True wireless headphones often have a tough time when it comes to comfort. Not only can they sometimes be uncomfortable, but they often fall out — making the right shape of headphones extremely important. Thankfully, the Rowkin Ascent Charge+ headphones are actually pretty good at staying in the ears, but you have to put them in the right way. They’re slightly awkwardly angled, and it can take some tweaking to ensure they’re properly in the ears. They’re probably not the best choice for running or going to the gym, but they’re still decent at staying in the ears. As with any kind of in-ear headphones, we recommend experimenting with the different sizes of ear tips to ensure you get the right fit. Ultimately, these are headphones — so no matter how much tech you stuff into them, the most important thing to consider is still how they sound. Thankfully, they don’t actually sound bad at all. For starters, the bass is relatively punchy and deep, delivering plenty of kick in the bassier drums, and solid tone for bass guitars. The bass doesn’t extend as deep as we might have liked — but that’s common from true wireless headphones like this. The mid range is a little mushy, but not terrible. There’s enough warmth in the low mids, and enough cut in the high mids, to be sure, but the frequencies seem to step on each others toes a little in some areas. We also found that the high mids were a little shrill in some situations — like the snare drum and main vocal on Eminem’s Forgot About Dre. The high end is pretty well-tuned, but it does seem to distort relatively easily. There’s some clarity and detail, but the headphones aren’t as shimmery as would have liked, especially for a pair of headphones in this price range. Ultimately, the Rowkin Ascent Charge+ headphones sound fine, but they aren’t incredible. The stereo separation is a little lackluster, and there are some troubling frequencies. True wireless headphones usually have a much shorter battery life than any other types of headphones, and that’s true of the Rowkin Ascent Charge+ headphones. The headphones have a battery life of 3.5 hours, which is on the lower end of the scale. Thankfully, however, the charging case delivers an extra 50 hours of battery life. According to Rowkin, the headphones connect through Bluetooth 5.0, making them one of the few pairs of headphones to do so. Considering the lack of Bluetooth 5.0 devices out there we weren’t really able to test the extra features on offer through Bluetooth 5.0 — but we can say that the headphones retained a connection well, and we didn’t really experience any unwanted skips or jumps during listening. The Rowkin Ascent Charge+ true wireless headphones pack all the latest tech inside of them, but that doesn’t make them worth buying in and of itself. Ultimately, what’s most important is how a pair of headphones sound — and there are other options that sound a little better. In this price range, for example, we would go for the JLab Audio Epic Air headphones, especially if you’re into sports. They’re simply better at staying in the ears. Still, that doesn’t make these not worth buying. We love that they use the latest tech, including that they charge wirelessly. On top of that, they do generally sound pretty good — even if there are better-sounding headphones in the price range. Considering the fact the headphones have a lot to offer under the hood, we’ve awarded them the Headphone Review Silver Medal.